The University of Akron further expanded its global footprint by entering into separate cooperative agreements earlier this month with three Vietnamese universities – Hanoi Law University, the National Economics University in Hanoi, and the University of Economics – University of Danang. University of Akron President Matthew J. Wilson and Dr. Patrick Gaughan, associate professor and assistant dean for global engagement in UA’s School of Law, traveled to Vietnam to sign memorandums of understanding (MOUs) with each institution, establishing a foundation for future collaborative relationships primarily involving law, economics, business, and social sciences. President Matthew J. Wilson signs a memorandum of understanding with the president of the University of Danang – University of Economics. Dr. Patrick Gaughan, (back row, second from right) UA associate professor and assistant dean of global engagement in the School of Law, assisted with agreement. “The MOUs are the first step in a formal process that we hope will eventually lead to attracting Vietnamese students to The University of Akron as well as initiatives such as faculty exchange programs, study abroad opportunities for UA students, international conferences, joint degrees, and online courses,” Wilson said. UA will now form action committees to explore and develop concrete plans to work with these potential partners. Vietnamese universities have long had formal collaborative agreements with European and Asian higher education institutions, but such formal pacts with U.S. institutions, especially public universities, are uncommon, Gaughan said. This international initiative began in 2016 when Gaughan contacted Vietnam’s Ministry of Industry and Trade about potential collaborative agreements between UA’s School of Law and that country’s law schools. An invitation was extended and Gaughan visited the schools in June. He said he found high interest among the Vietnamese schools to establish formal relations not only with Akron Law, but with additional UA academic units. “Each of these potential partnerships offer distinct advantages,” Wilson said. For example, Hanoi Law University trains about 60 percent of the legal professionals in Vietnam so its interest with UA primarily focuses on law programs. The other two institutions also are interested in collaborations with Akron Law, he said, but want to establish additional formal ties with UA’s College of Business Administration and possibly other academic units. Wilson is the former dean of UA’s School of Law and a distinguished scholar on Asian and international law. While at the National Economics University, he was asked to share his expertise with students and faculty, and obliged by giving a presentation titled “UN Convention on Contracts for the International Sale of Goods: Some Perspectives from the U.S.A.” Vietnam acceded to this Convention on Jan. 1, 2017. 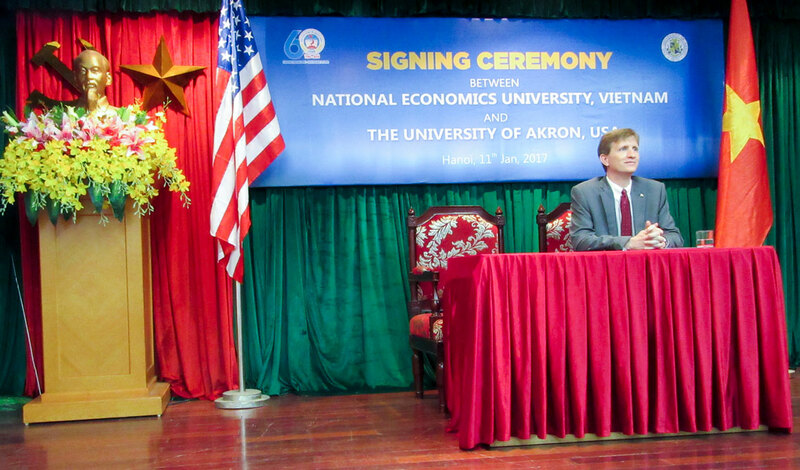 President Matthew Wilson also was a featured speaker at the signing ceremony between UA and the National Economics University in Hanoi Vietnam. UA has grown several existing MOUs into successful international academic and research relationships. In 2016 UA’s College of Polymer Science and Polymer Engineering (CPSPE), renewed MOUs with nine Chinese institutions and engaged two new institutions through its Akron Master’s Program. The agreements have brought 296 students to an accelerated degree program at UA, with 99% of those students completing the master’s degree. About 73% of those graduates enrolled in Ph.D. programs at UA and other universities throughout the world. Recently, Akron Law has entered into MOUs with top universities in Japan, South Korea, and China. This has led to a dynamic two-country, three-city, four-week study abroad program for Akron Law students in Tokyo, Nagoya, and Seoul as well as visiting international scholars on the UA campus and online cross-border activities.